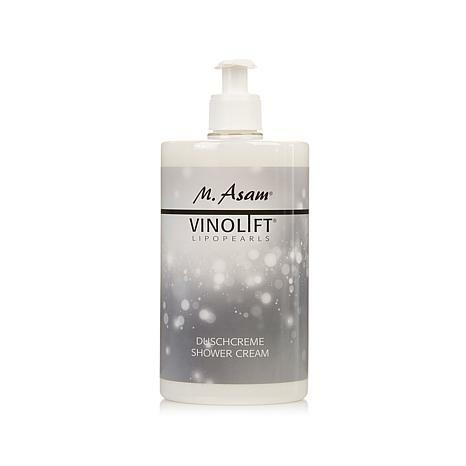 Turn shower time into an indulgent experience with this luxuriously rich shower cream. Formulated with grape seed and almond oils, the moisturizing cleanser helps leave your skin feeling soft and looking smooth. Let its light scent wash over you as you lavish your skin with some TLC. Ingredients: Aqua (Water), Coco-Glucoside, Prunus Armeniaca (Apricot) Kernel Oil, Glycerin, Vitis Vinifera (Grape) Seed Oil, Cocamidopropyl Betaine, Disodium Cocoyl Glutamate, Prunus Amygdalus Dulcis (Sweet Almond) Oil, Parfum (Fragrance), Styrene/Acrylates Copolymer, Vitis Vinifera (Grape) Seed Extract, Vitis Vinifera Fruit Meristem Cell Culture, Tocopheryl Acetate, Resveratrol, Ubiquinone, Ascorbyl Tetraisopalmitate, Tocopherol, Isoniacinamide, Lecithin, Xanthan Gum, Carrageenan, Sodium Phytate, Sodium Chloride, Citric Acid, Isopropyl Alcohol, Alcohol, Benzotriazolyl Dodecyl P-Cresol, Behentrimonium Chloride, Potassium Phosphate, Caprylic/Capric Triglyceride, Glyceryl Glucoside, Diisopropyl Adipate, Sodium Benzoate, Potassium Sorbate. I trust all the research and science behind this brand I've been a user for years. I have to say honestly this is the most luxurious shower cream I have ever used. The scent is so beautiful. I will never use anything else, and I have used the biggest names out there. I'm sold!! I tried this for the first time and gave one as a gift. This product I love but thought it was a little thinner than I thought. I leaves your skin soft and smooth and really helps after you shave your legs. Fragrance is much like the moisturizer like a sweet vanilla sugar cookie. If you have dry skin THIS IS the product for you. My skin loves it-Ilove it. If you have dry skin in the winter months, this will be helpful. I love the smell and the feel on my skin. It is also good when you shave your legs. My husband uses it on his legs also and says they are less dry than before.